It’s time to kick off the New Year with a Designer Spotlight (you can catch up on previous posts dedicated to my Designer Spotlight feature by hovering your cursor over the Designer Spotlight title on my Menu at the top of my page). James Mayor Furniture came under my radar because his work is of such an utterly high standard. The attention to detail, the precision and bespoke nature of his designs beg you to take a closer look. And that’s exactly what we’re going to do. This company has been in business for almost 20 years and prides itself on crafting tailor-made bespoke furniture that is entirely British made. I would imagine that as a client, having a bespoke piece of furniture made to your exacting requirements (which is also truly unique) would make you feel kinda special, right? I had a browse at James’ portfolio via his website and discovered a few hidden gems! What I like about James’ furniture is the wide range of styles he has produced. From Art Deco inspired, to modern and contemporary with industrial design elements. Time for some eye candy! I have to admit, there are two images in particular, from his portfolio of works that REALLY appeal to me. 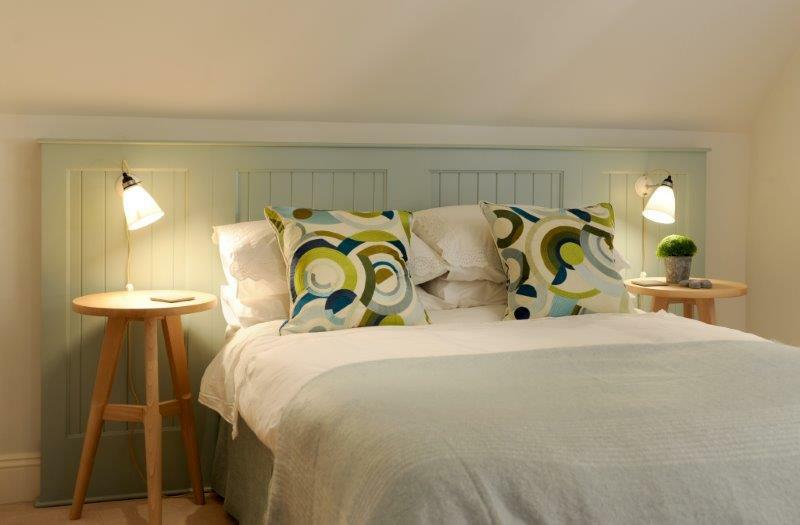 The first one is this Shaker style headboard. Love the soft, serene colour. Love its clean lines and simplicity. And I absolutely ADORE the fact that it has been placed alongside stools, acting as side tables. 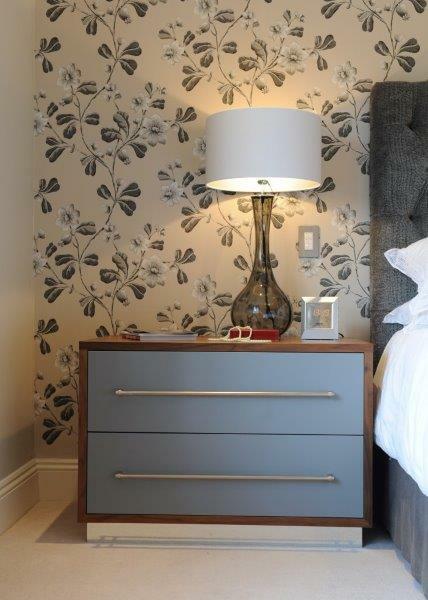 The headboard’s traditional styling is a very effective contrast to the more urban aesthetic of the stools. This is also a very clever way to gradually introduce peeps who are nervous/cautious of incorporating contemporary styling into their designs because it is so subtle. 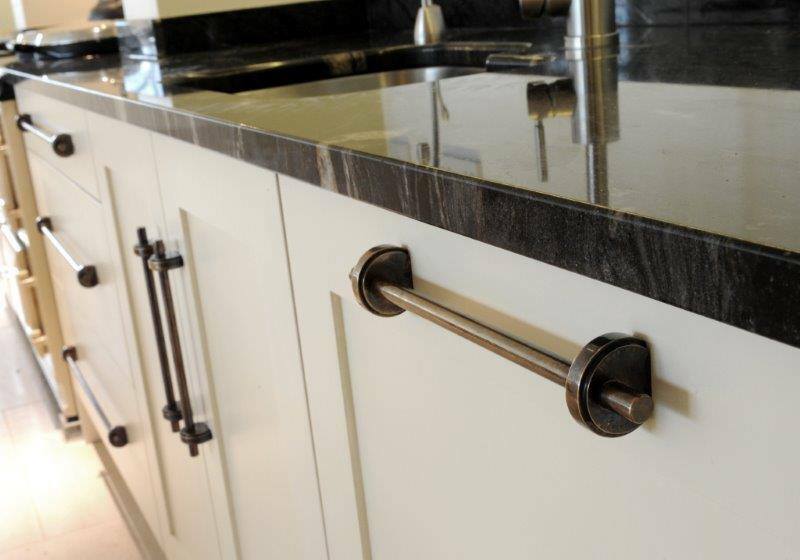 Next up, is a bespoke kitchen that has very, very intriguing handles. I cannot even begin to tell you how excited I was at seeing these handles. I know what you’re thinking, ‘they’re only handles’. But you’d be wrong! Oh, how wrong!! They’re edgy, full of character, unique and downright cool! Let’s take a few minutes to really absorb their profoundness, funkiness and, and…loads of other great words that end in ‘ness’ that I can’t think of at the minute. But James Mayor Furniture isn’t a one trick pony. No, sir! 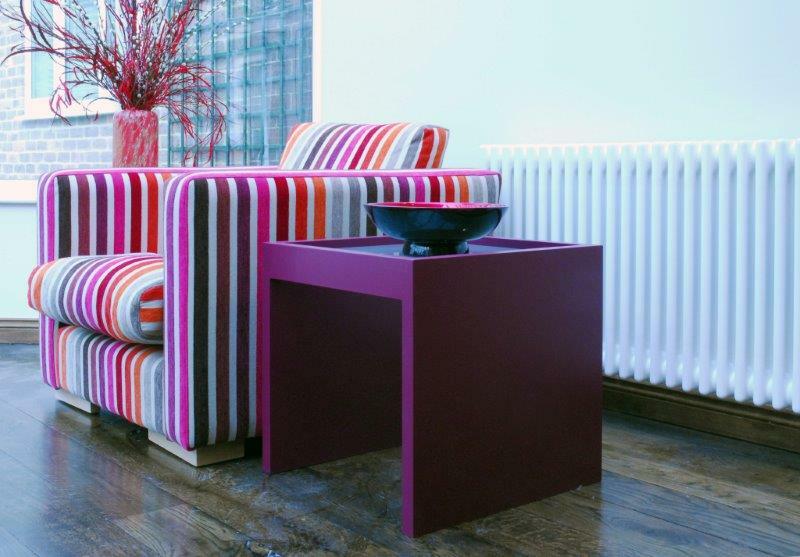 He has also produced modern pieces in brightly coloured hues that pack a punch. Like this side table, for example. Slightly off topic, but how awesome is the fabric on that chair?!! 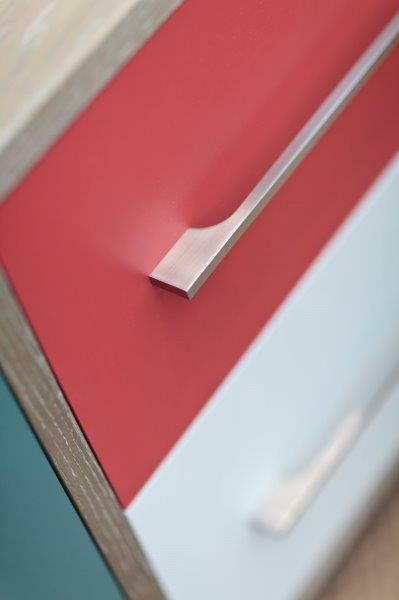 Purple isn’t the only colour that can be seen in James Mayor Furniture’s portfolio. 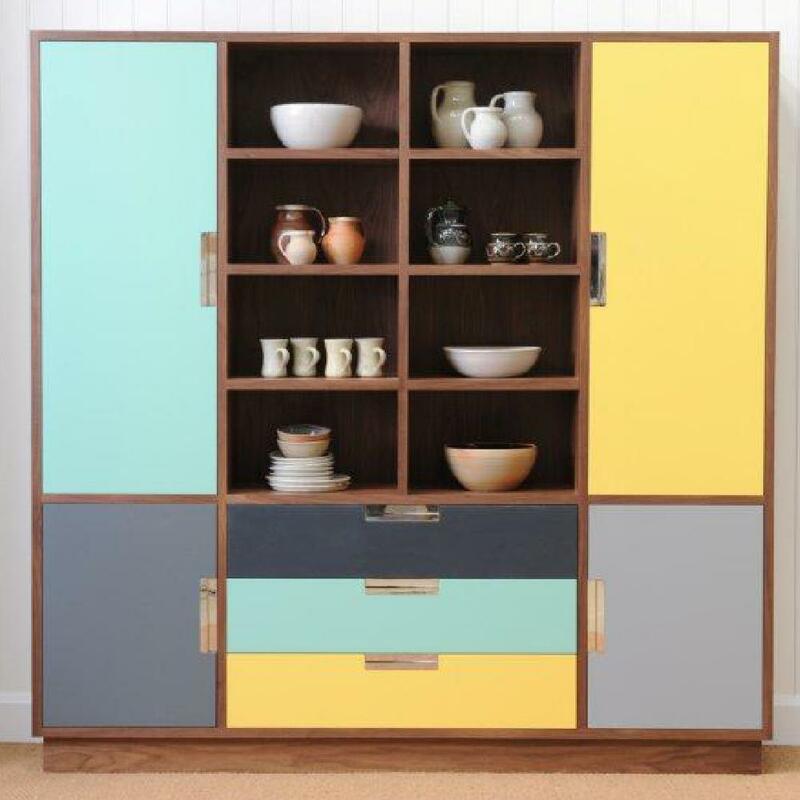 And a kaleidoscope of mid-century hues, as can be witnessed in this retro styled 50s cabinet. So, if it’s attention to detail, unique and bespoke that you’re after, I highly recommend that you check out the James Mayor Furniture website.